To stand up to the competition and land the position you want, you need an effective and well-designed resume. This professional document may be your only chance to demonstrate your skills and work experience to potential employers. Not only does it need to promote your abilities, but the layout should look professional as well. To help you design a good-looking document, our professional restaurant server resume templates can guide you through the process of pointing out your abilities in a visually appealing way. Your document should include all the essential information, such as abilities and education. Our professional-looking templates will help keep you focused. Why Use Professional Restaurant Server Resume Templates? Are you wondering if it matters whether you use professional restaurant server resume templates? Hiring insiders say that most recruiters spend a mere six seconds glancing at resumes before making a decision. Catching their eye right away is crucial if you want a chance at coming in for an interview. Using our templates can help your document stand out as well as walk you through the important sections such as your work positions and skill sets as well as your education background. When considering professional restaurant server resume templates, the contemporary layout may be a good choice. The restaurant industry is constantly changing, and many establishments have a more modern and contemporary feel. This style may fit with some of the newer restaurant concepts and help you stand out over traditional resumes. It also helps you organize your work experience and skills in easy-to-read columns. When deciding between professional restaurant server resume templates, the one page layout is a strong choice. Even if you have a work history that spans over 20 years, a single page is the right length for this traditional job. Being organized is crucial in order to include all important facets. If you do have a lot of experience, focus on the most recent positions and be concise in your wording. When searching for professional restaurant server resume templates, sometimes a simple format works best. It is easy to create and to read, allowing recruiters to quickly see what skills and background you are bringing to the job. Professional servers typically have years of work experience and are highly accomplished in the hospitality industry. 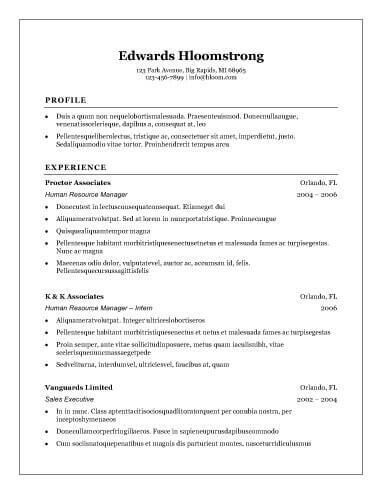 As a result, this combination resume style is a good choice to use. Serving is a classic profession, and a classic resume template works well for applicants. Professional positions often call for a more formal approach, so this layout is a good choice for those applying to high-end establishments. Because you may be applying to a variety of spots, this layout makes it easy to customize the resumes quickly for each job posting. Another template that demonstrates cleanliness and simplicity is the traditional layout. It shows you understand the status quo and will fit well into a proven system. This template allows you to include all your professional accomplishments while keeping it easy to glance over. Your traditional resume should convey that you can adapt and learn quickly, which makes you qualified for a number of different serving jobs. Make sure your information is professional. This includes not only your email address but also your voicemail message in the event the employer calls you. Use numbers and quantitative measures to show how you contributed to the job. Employers want to see how you will add value to the position. Even when you use a resume builder, make sure you customize your document for each position you apply for. This prevents it from reading like it is the creation of a robot. Skilled hiring managers can pick out generic documents, so make sure you take the time to make the necessary changes to personalize yours.